Venezuela’s political showdown moves to the United Nations Saturday where a Security Council meeting called by the United States will pit backers of President Nicolas Maduro against the Trump administration and supporters of the country’s self-declared interim leader Juan Guaido. US Secretary of State Mike Pompeo is expected to address the meeting along with Venezuelan Foreign Minister Jorge Arreaza and the other council members, which include supporters of both dueling presidents. The session focusing on Venezuela’s crisis comes a day after Guaido vowed to remain on the streets until his country has a transitional government, while Maduro dug in and accused his opponents of orchestrating a coup. “They can cut a flower, but they will never keep spring from coming,” Guaido told supporters Friday, alluding to a similar phrase from the Chilean poet Pablo Neruda. Guaido’s talk with reporters in a plaza in Caracas turned into a de facto rally as thousands gathered after hearing he would speak in public for the first time since taking a symbolic oath Wednesday proclaiming himself the nation’s rightful leader. The government of President Donald Trump announced it was recognizing the 35-year-old leader of the opposition-controlled National Assembly quickly after his oath, leading Maduro to say that he was breaking all diplomatic ties with the United States. Guaido’s move is the most direct challenge to Maduro’s rule despite years of protests at home and international efforts to isolate the regime amid a growing humanitarian crisis fueled by falling oil prices and government mismanagement. Maduro is accusing the opposition of working with the US to overthrow him. 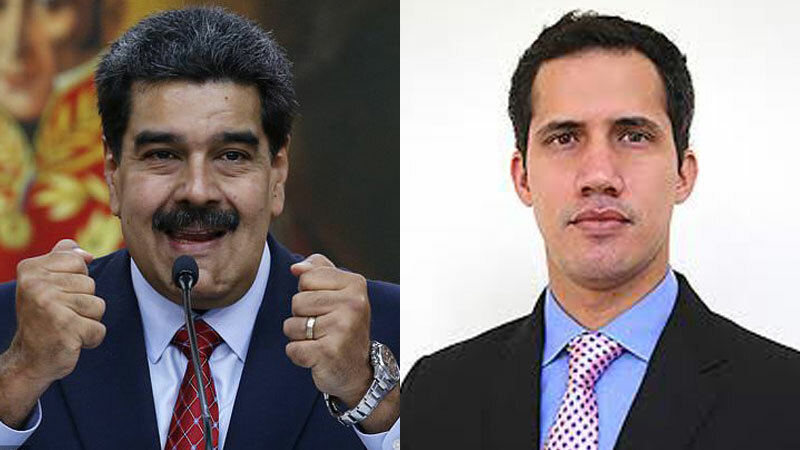 Though over a dozen nations as well as the Inter-American Development Bank are recognizing Guaido as president, Maduro still has the support of the military and powerful, longtime allies like Russia and China and is vowing to defend his socialist rule. Both sides attempted dialogue last year, but it fell apart as Maduro pushed forward with an early election that the country’s most popular opposition leaders were barred from running in. Many in the international community condemned that vote and now consider the National Assembly, which Maduro has stripped of its power, the only legitimate institution. Saturday’s Security Council session comes despite Russia’s objection to its focus on Venezuela, according to UN diplomats. It wants the focus changed to threats to international peace and security because as Russian Foreign Minister Sergey Lavrov said, it sees US actions as an “obvious call for a coup d’etat” – which would threaten peace, the diplomats said. Venezuela’s UN Mission asked for foreign minister Arreaza to be put on the speakers list and well-informed council diplomats say there is likely to be no objection. But the diplomats, speaking on condition of anonymity because discussions have been private, said there is expected to be a procedural vote called for by Russia. Diplomats said the US is expected to win the procedural vote and go ahead with the meeting focused on Venezuela. The standoff is taking place as international concern over repression by state security forces during the days of political upheaval mounts. UN human rights chief Michelle Bachelet’s office said Friday it has credible reports that security forces or members of pro-government armed groups have shot at least 20 people during protests on Tuesday and Wednesday and is calling for an investigation. The total figure is likely higher: The Venezuelan Observatory of Social Conflict says 21 people were killed by gunfire in protests and looting on Wednesday and Thursday, on top of five deaths authorities confirmed Tuesday. The Penal Forum human rights group says that 369 people have been detained since Monday. “The international community is watching more closely than ever before, so Venezuelan security forces – and those commanding them – should know they will be held to account for any abuses,” Jose Miguel Vivanco, the Americas director for Human Rights Watch, wrote on Twitter. US and Venezuelan diplomats are finding themselves caught in the crosshairs. On Wednesday, Maduro gave American diplomats 72 hours to leave the country – an order Washington said it would defy by keeping the embassy open, though it told non-essential staff to leave. On Friday morning, a caravan of black SUVs escorted a contingent of US embassy workers and their families to the Caracas airport. They were later seen checking into an American Airlines flight. Maduro, meanwhile, has recalled all Venezuelan diplomats from the US and ordered the nation’s embassy and consulates there closed. Guaido, seeking to sidestep Maduro, has urged all American and Venezuelan staff to stay in their posts. Amid the tension, the US on Friday named Elliot Abrams, a hawkish former Republican official, to handle American policy toward Venezuela. Maduro has not shown any hint he’s ready to cede power. He called Guaido on Friday “an agent for the gringos in Venezuela,” using a sometimes derogatory term for Americans. But he also said that he would be willing to talk with US President Donald Trump and the opposition. Guaido, in his remarks earlier Friday, said he’d be willing to talk with any party willing to discuss restoring democracy, but short of that, he said there would be more protests.